If industry analysts are correct, we could see a smaller, lighter version of the Nintendo Switch in the next couple of years. The Nintendo Switch has done exceptionally well for Nintendo since it launched last month, becoming the company's fastest selling console ever. Some industry analysts think that the success of the console will lead to Nintendo releasing another variation of the unit sometime in the next couple of years. According to a Bloomberg report, analysts at Citigroup Inc. are speculating that the Switch is too large for kids to easily take it on the go, and that the need for a smaller unit could lead to a "Switch Mini" being released in the coming years. 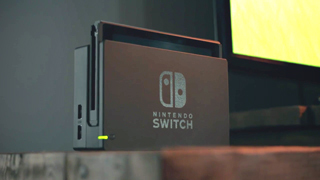 In an April 13 report, the analysts wrote, "Although the Nintendo Switch can be used as a handheld device, we think smaller children could struggle to use it comfortably in that format due to its size and weight. Accordingly, we think Nintendo will launch a lighter, dedicated handheld version of the Switch, possibly to be called the Switch Mini." While the analysts didn't guess at what a Switch Mini might cost, they did have some predictions as to how many units Nintendo might sell. The report speculates that such a device could sell 6.7 million units in the 12-month fiscal year ending in March 2019. Alongside that, they expect Nintendo to have sold 25.7 million units of the standard Switch by then. A smaller, lighter Switch could be interesting, although if Nintendo decided to release such a unit, it would likely spell the end of the 3DS. That said, if Nintendo could release a smaller Switch that could play the same games as its bigger brother, it might catch the interest of some dedicated handheld players. We'll just have to wait and see if this prediction comes true.